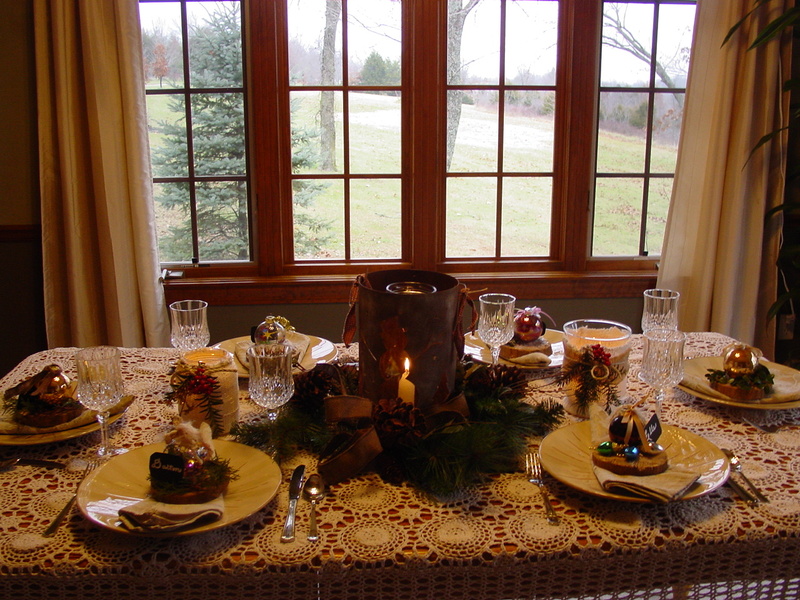 I’m dreaming of a beautiful tablescape for Christmas brunch. I lust spend hours looking at and pinning gorgeous settings on my Pinterest boards. When I try to create them, I fall short. When I try to capture even that shortness on camera, I completely fail. That never stops me from trying. Remember those wooden discs I left from last post? No? Well, let me refresh your memory. 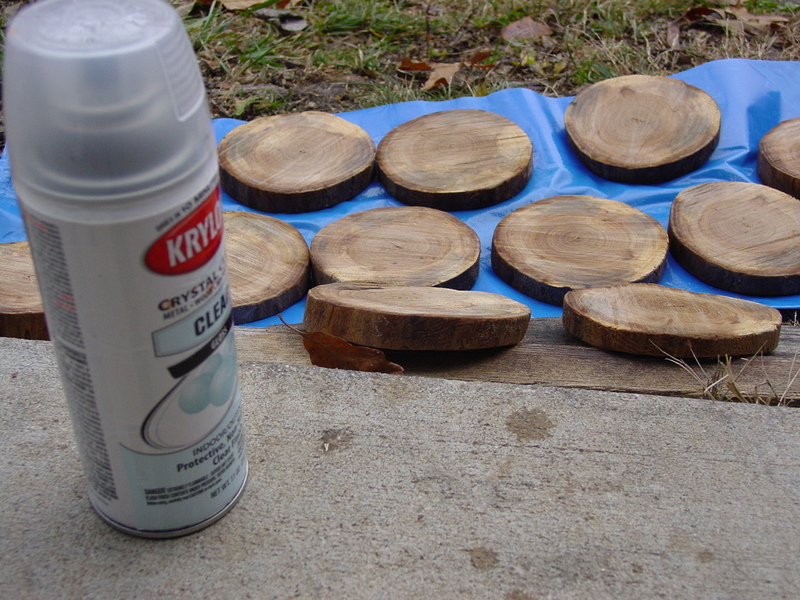 I realized my wooden circles were much larger than the ones I wanted to recreate. 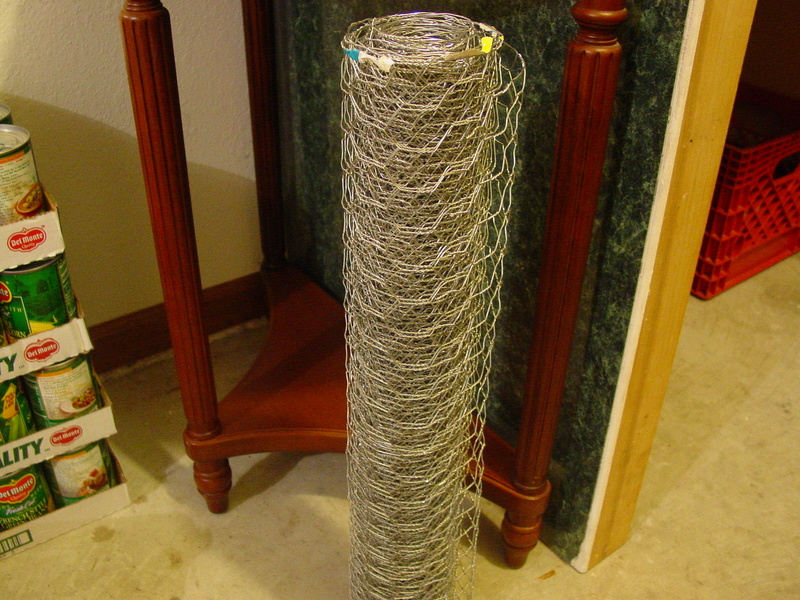 I also knew I wanted to use what I had on hand rather than adding to my chaos stash of Christmas decor. 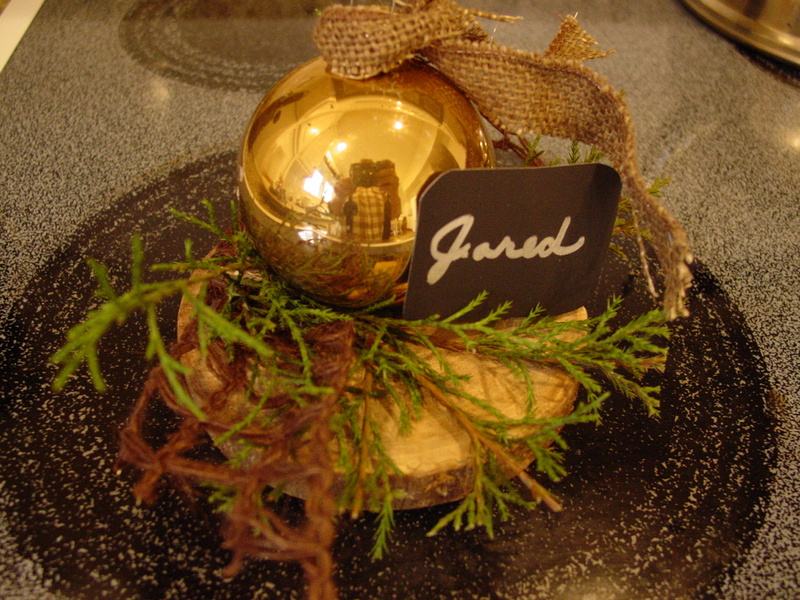 I loved the small jewel toned ornaments that The Red Head used, but I had only clear, burgundy, and gold. 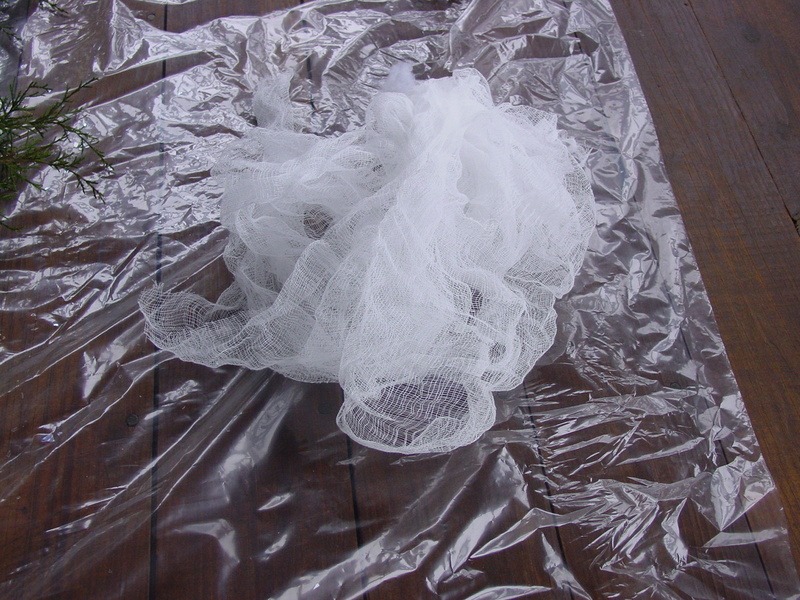 And, what I did have was crinoline. I love that stuff! There’s just something so romantic and feminine about it, agree? I also had a whole woods full of nature. So, I went gathering the naturals: boxwood, cedar, bark, twigs and sticks. Then I got my supplies and trusty hot glue gun. Just when I thought I had all that iridescent snow cleaned up, I grabbed it and started sticking it onto those wooden discs. 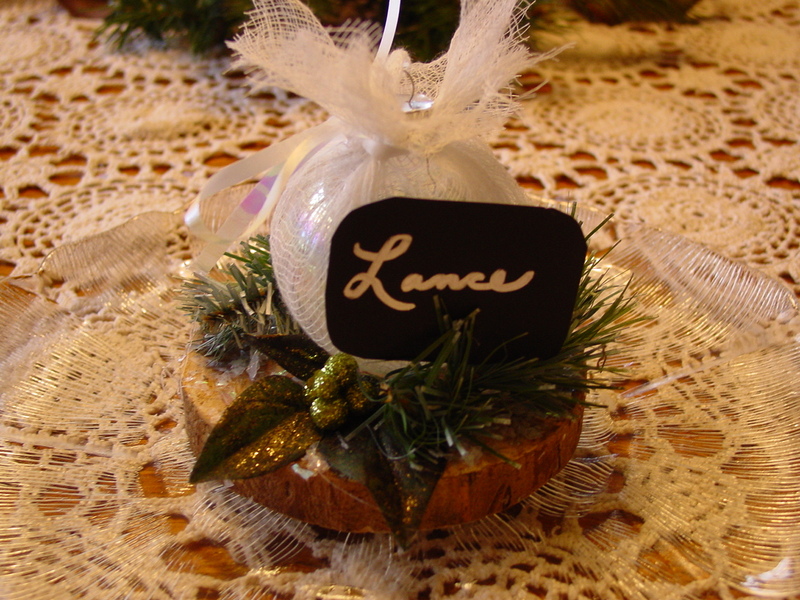 I started with the clear ornaments which I wrapped in crinoline and tied with shiny pink or white ribbon. I used a bit of the naturals plus odds and ends I had in my craft bag. 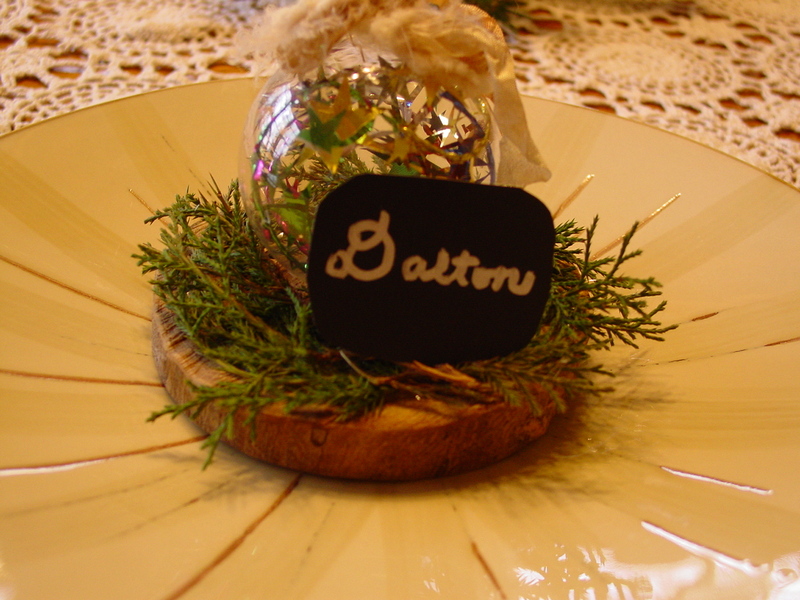 When I had hot glued the ornament to the disc and added greenery, etc, I cut some black tag board rectangles for the names. My intent was to use a chalk pen so it would be erasable. Silly me. The chalk pen didn’t show up well enough, besides, who wants to store and reuse black paper rectangles? A metallic pen worked much better. I had six clear ornaments, which I wrapped in crinoline. One table will only seat six people. The other six mixed ornaments needed to be cohesive in some way. I’m not into the matchy-matchy, but I did want them to look like they belonged together…like family, you know. The naturals I had gathered worked in doing just that. Here are a few of them. And here’s what they look like all set up and ready for breakfast. I know what you’re thinking…this girl really needs a new camera, and it’s probably true. But then I would need a tutor. You know, If You Give a Girl a Camera, she’s gonna want to take some pictures. And when she turns on the camera, she’s gonna need someone to show her how to use it. I’m thinking a photography class might be a good first step. So what I lack in photography skills, I make up for in cre I still lack in photography skills. Never let it be said that I am not persistent, though. Or conservative. 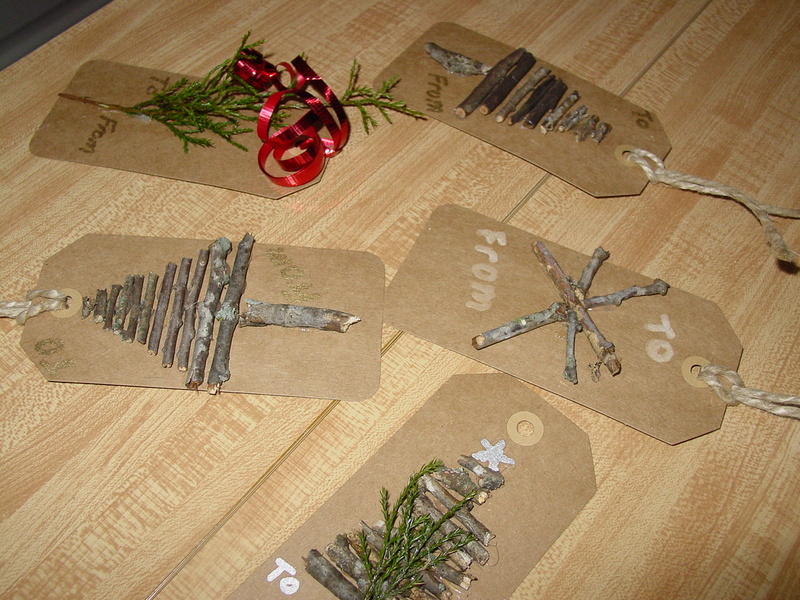 Just look at the Christmas tags I made from the leftover sticks and twigs. I’m not giving up on making the cute ones I linked you to…just not this year. 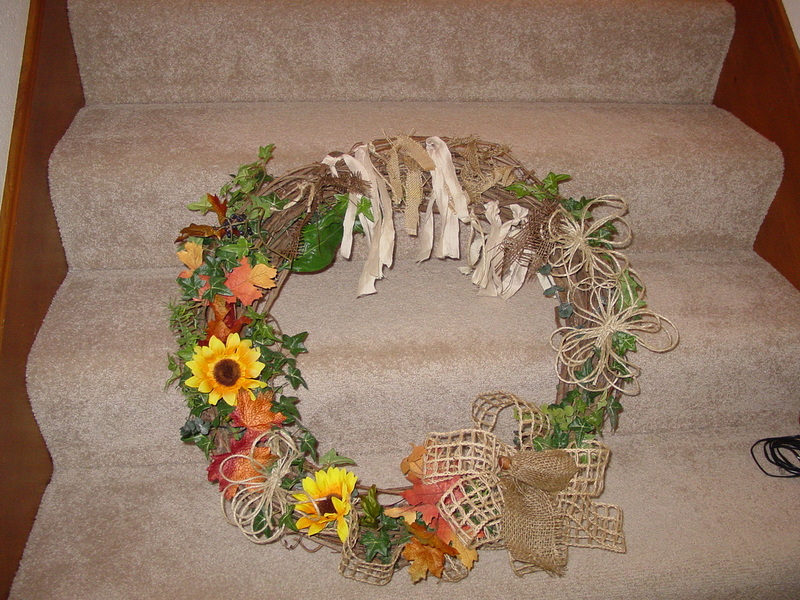 I picked up this grapevine wreath for a couple of bucks at a garage sale this weekend. 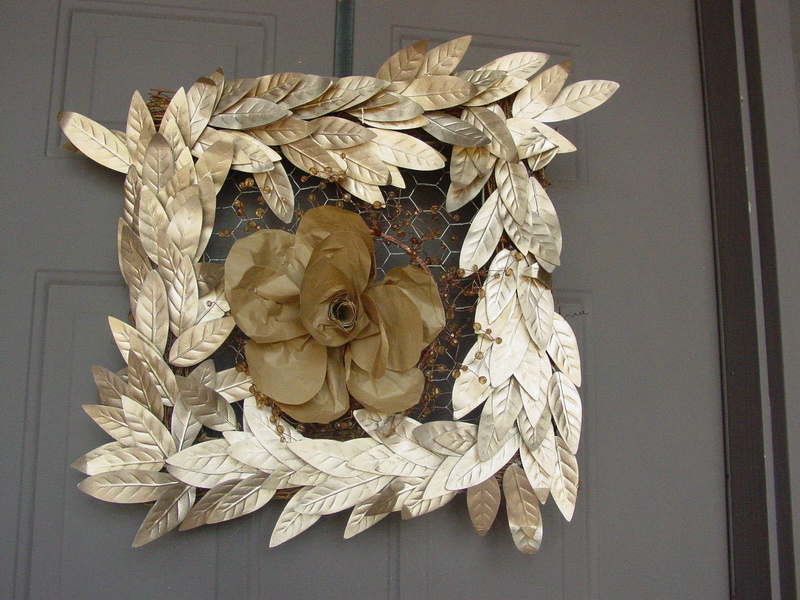 I thought it would be perfect for a summer to fall makeover that would add some curb appeal to our son’s house. He and his new bride have three houses right now…his, hers, and theirs. So, we have been busily getting two of them ready for market by Labor Day weekend. 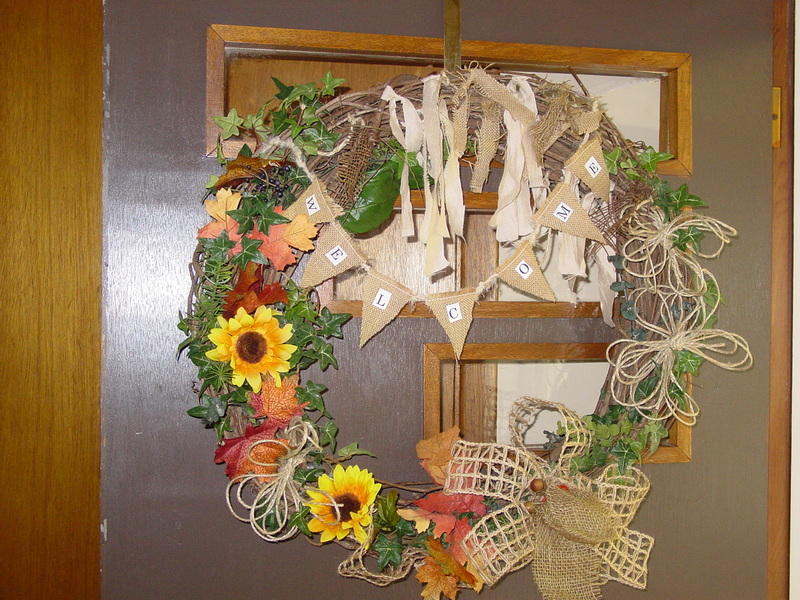 I planned to remove the greenery, but since I wanted a summer into fall wreath, I decided to leave the summer element and just add some autumn touches. 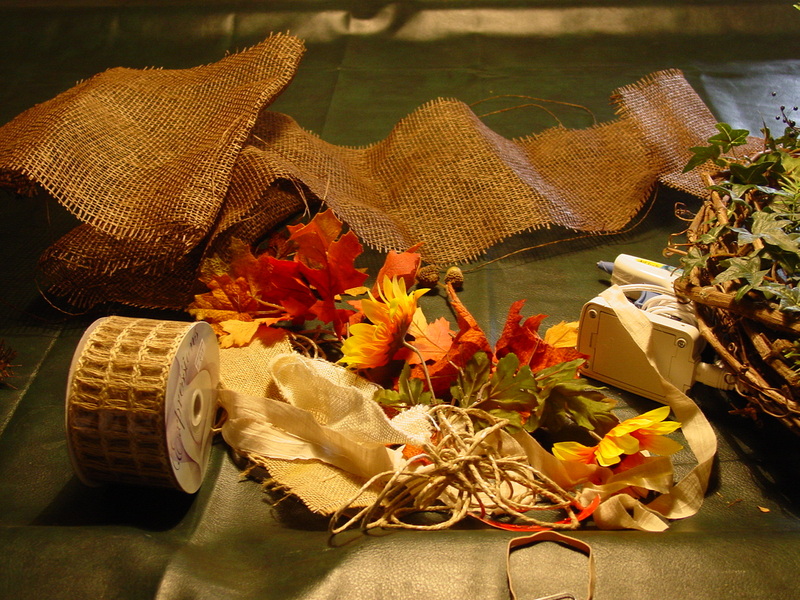 This is the junk collection of materials I already had…burlap, of course, leaves, sunflowers, fabric strips, twine, and wired basket weave ribbon. 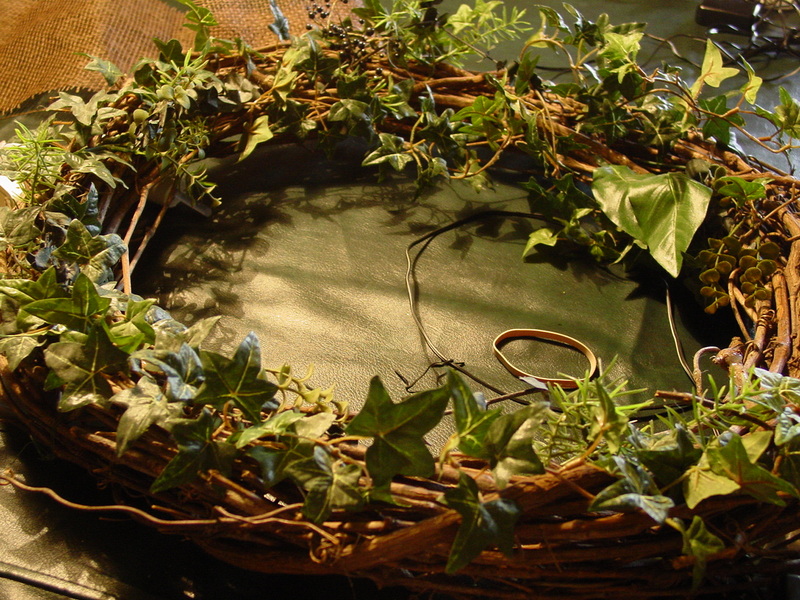 I made three twine flowers (the tutorial for that is in an earlier post from Christmas) and started tucking leaves here and there. 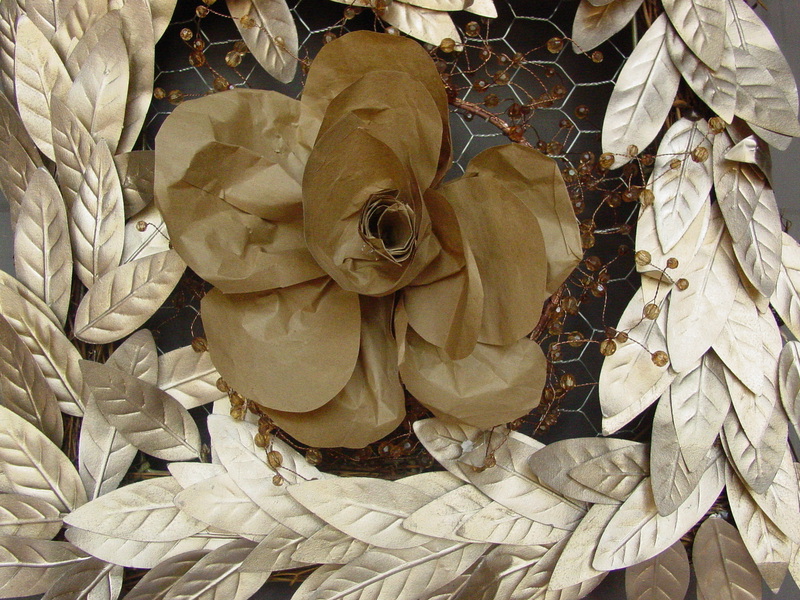 I didn’t glue anything until I played with the placement of the leaves and sunflowers on one side of the wreath. 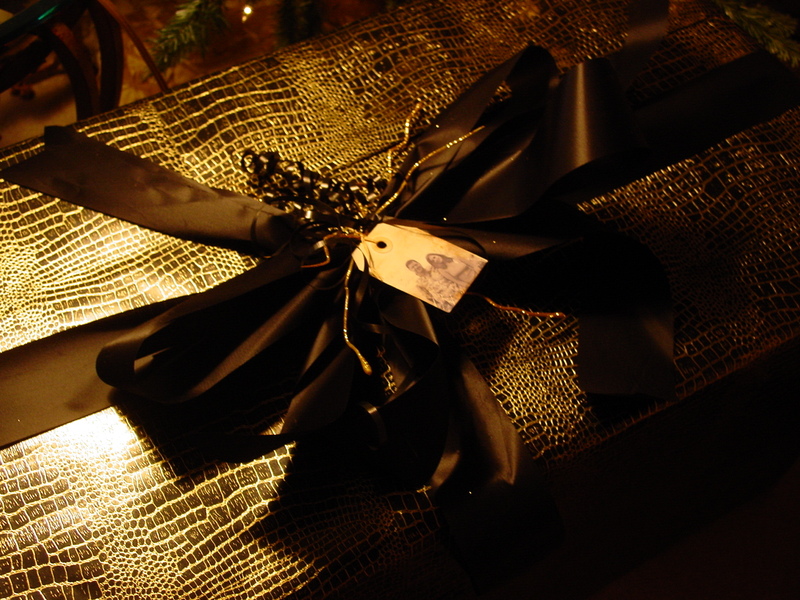 Next, I made a bow with the wired ribbon and a touch of burlap. I like the bow at the bottom. But that leaves one side practically naked bare. I love the look of the wreaths that have knotted fabric strips all around, so I decided to try adding a few strips of neutral fabrics to the blank spaces. Nice…but I wanted it to be a bit more welcoming. 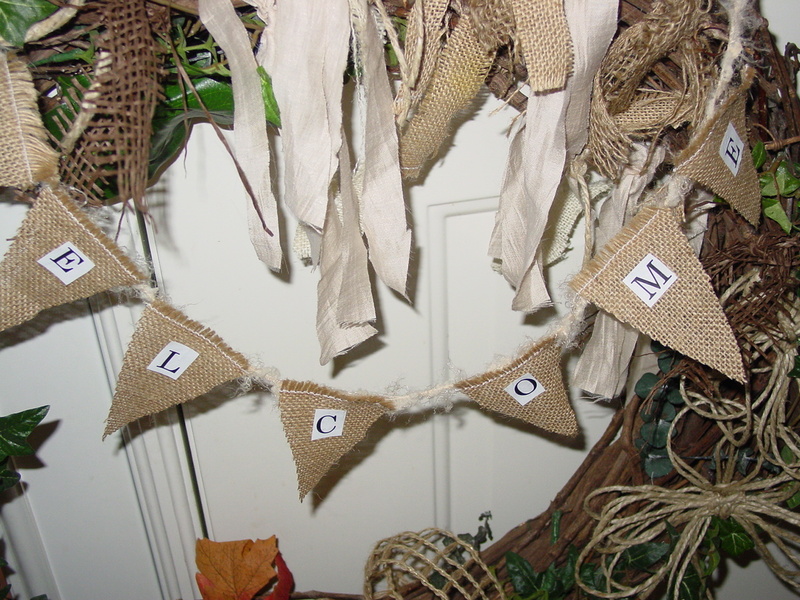 How about a WELCOME bunting? 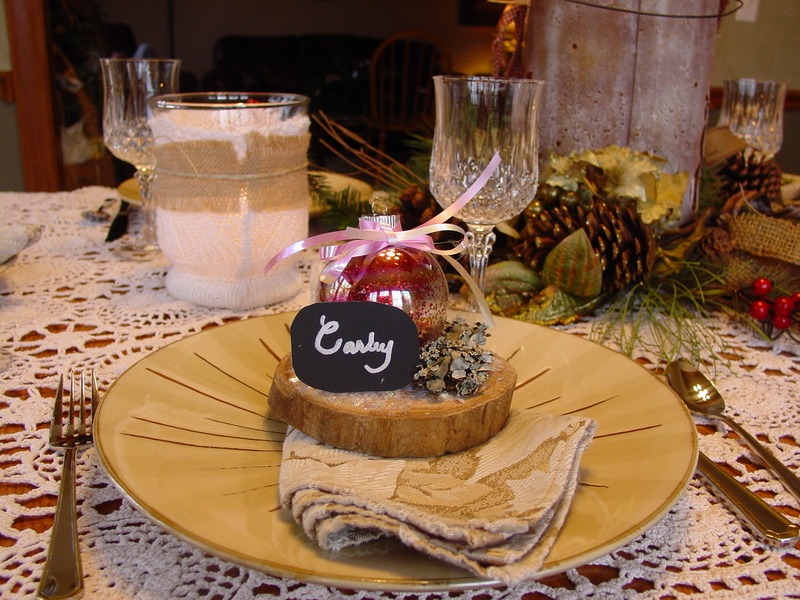 Out of burlap? I took it right over and hung it on the door. I think it will work with the other things I have in mind for the porch. For now. I wish! Oh, how I’d like to say that I have everything done and am anxiously awaiting our Christmas celebration. Not so, this year. But, I’m getting there, and, due to this lingering cold, I have had to be somewhat resourceful. Since much of our time is spent shopping for that perfect gift, wrapping, and cooking, I thought I’d share a few helpful tips. Now, I can’t help with that perfect gift. If any of you have tips for that, please share come do my shopping! 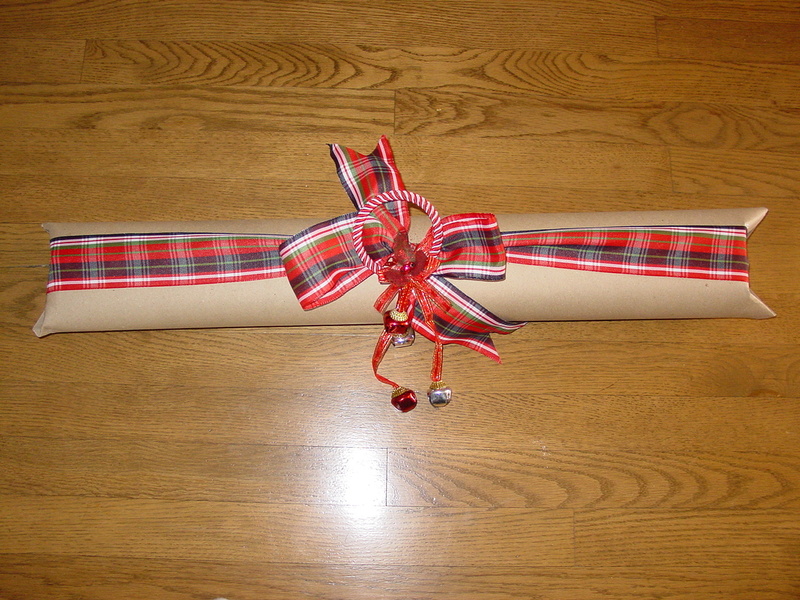 But, for wrapping, I am using whatever I can find. I admit to going to the Dollar Tree for some wrapping paper, though. Now, I love the Dollar Tree, but there are some things that are better not purchased there. Wrapping paper is one of them! Talk about cheap paper. It ripped when I plopped placed the gift on it. I had some better quality paper left over from last year, so I am making do. 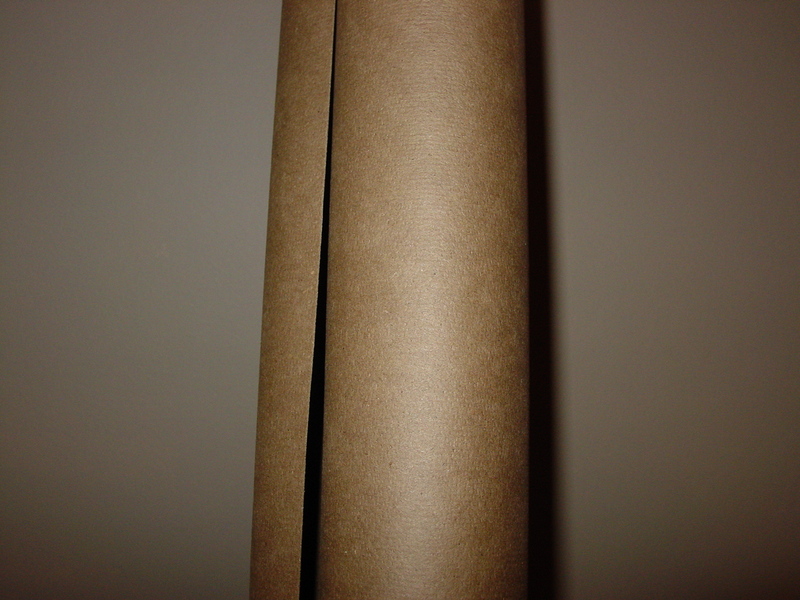 So, at the end of the cheap paper, you get a tube, but at the end of the more expensive paper, you get this. It’s a really nice, heavy piece of paper. I decided it would make a cute “wrapper” of some sort. I folded the ends down like a little pocket and tied it with some leftover ribbon. I added a Dollar Tree embellishment, also left over from last year, and it turned out surprisingly cute. And I’ll bet you would never guess what is wrapped up in there. I would tell you, but it’s a secret. 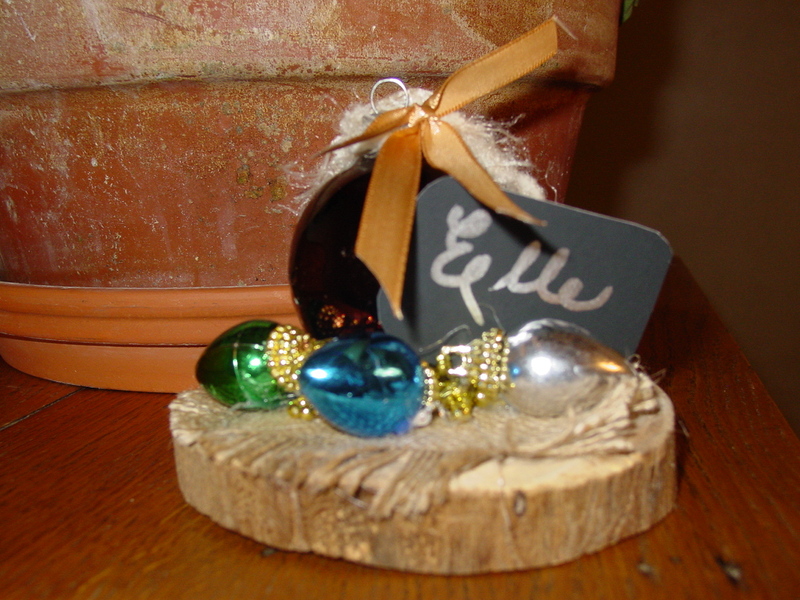 Another thing I have had left over for six years are the wine glass tags I made for our daughter’s wedding. (In an earlier post I mentioned that I was so busy I forgot to have the tags handed out.) Welllll, perfect for a Christmas tag. 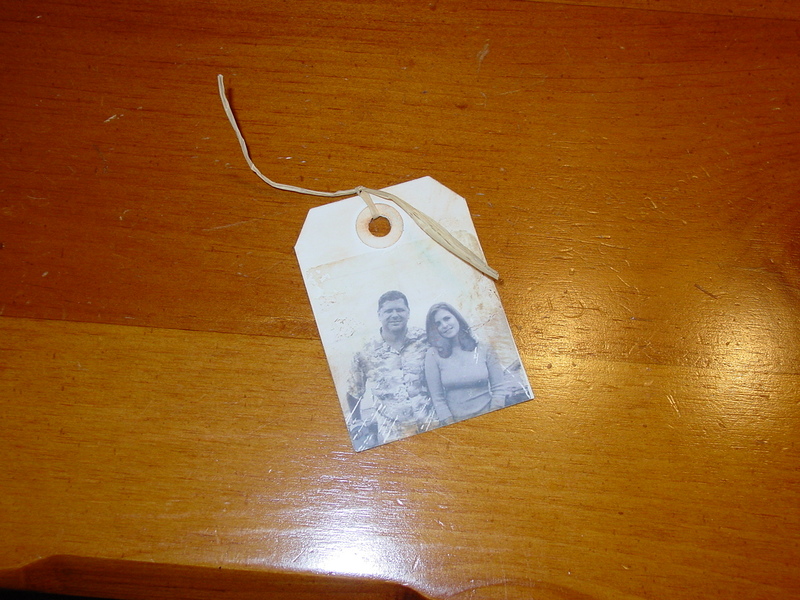 I made them by printing out a photo in sepia tones and using Golden Gel Medium to transfer the image onto a manilla tag. So, here it is attached to the package. 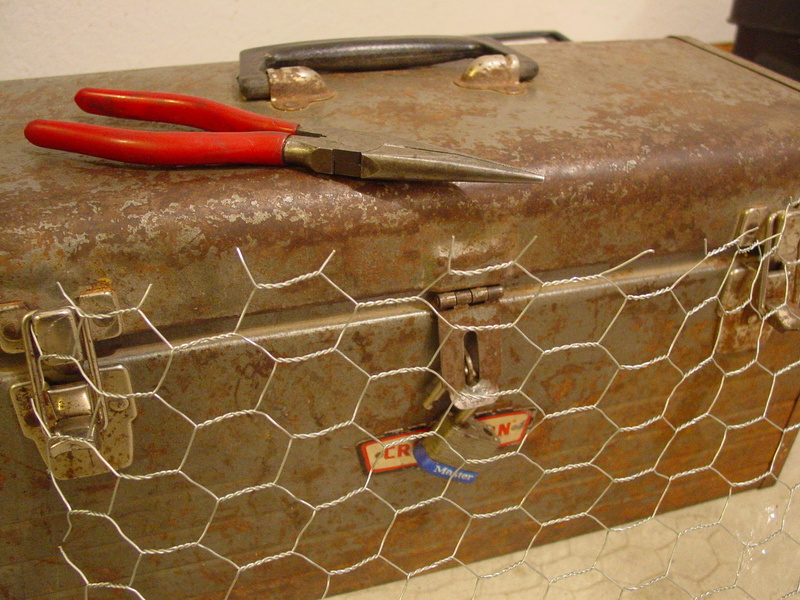 And I always have jute twine. I saw some really cute twine flowers on Pinterest. 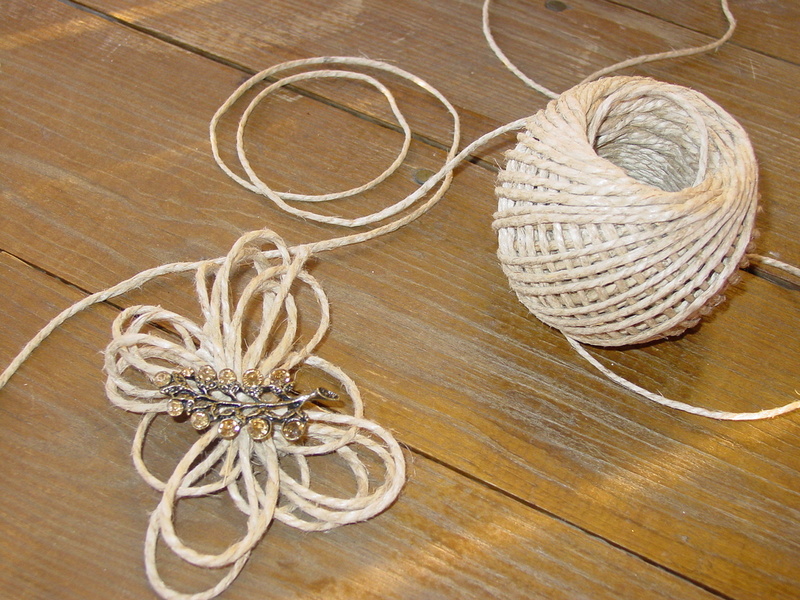 You can find the tutorial here.http://www.thebugbytes.com/2012/02/twine-flowers.html. I didn’t have the right kind of needles, and anyway, I don’t sew much, you know. So I just looped, gathered, and tied. I could embellish with an antique brooch. But, I just pinned this one to a Kraft paper bag with jute handles. And now, for the cooking time-saver. My “go to” appetizer has gone from cheese ball to roll-ups. 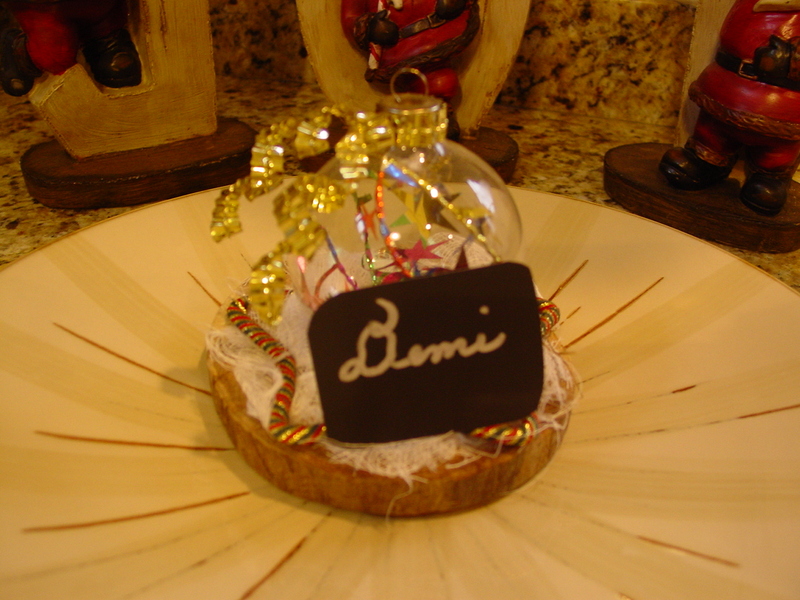 You can make them as simple or festive as you wish. Our favorite is the dried beef roll up, but we also love the chili-olive ones. The staple is cream cheese and the wraps are tortillas. I’m making both of them this year, along with this variation that is a bit more festive. Mix all together and spread on tortillas. Roll up and refrigerate at least an hour before slicing. Follow same directions as dried beef ones. I toasted half a cup of pecans and chopped them into the mixture. That makes it a bit harder to spread, but oh, so worth it. 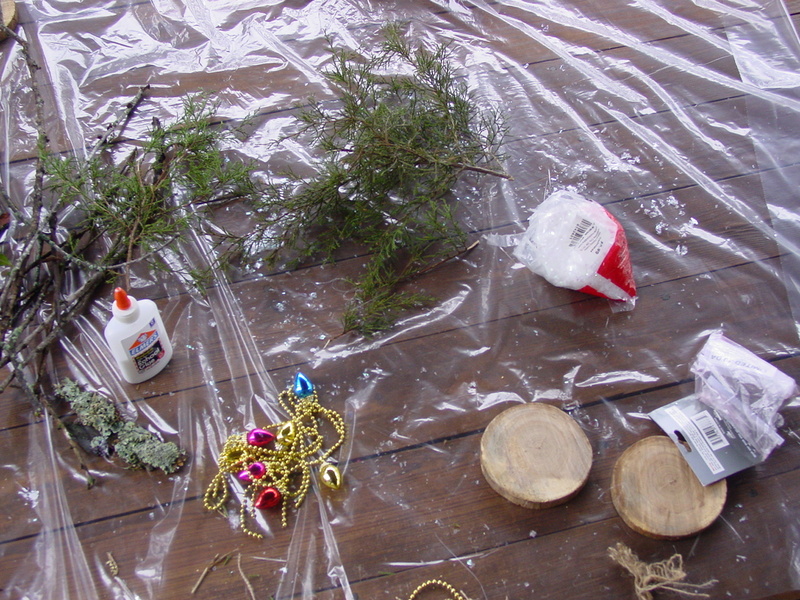 Since we are celebrating Christmas this weekend, I made these spreads today and stored them in zip lock bags. I’ll take them out in a couple of days, spread them, roll them up, and slice them. Easy peasy! Enjoy!